Look up “music” in the dictionary and you might find multiple definitions, but all refer to “sound.” You can enjoy and perform music without sight, and certainly there have been profound musical talents throughout history who are blind. 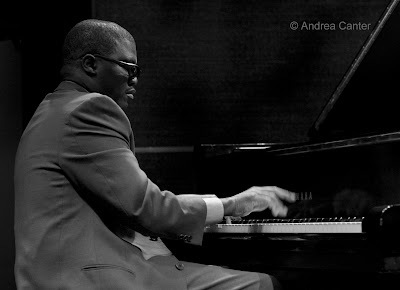 Marcus Roberts is a good example among recent visiting jazz artists. Sight, however, adds another dimension to the experience, at least for those in the audience. Among jazz drummers, there are those who prompt us to close our eyes and concentrate on the rhythms. Then there are those who must be seen as well as heard to fully appreciate the passion underlying their art. To close one’s eyes would reduce the potential enjoyment. I have a growing list of jazz drummers for whom I want good sightlines as well as acoustics. Locally there’s Jay Epstein, JT Bates and Dave King. Nationally there’s Winard Harper, Steve Smith and Ari Hoenig. 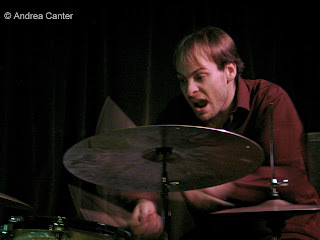 Ari Hoenig is as much an acrobatic entertainer as percussion magician, and his efforts can conjure the sleight of hand. A juggler, he seamlessly moves from sticks to brushes to mallets to the use of an elbow to dampen the skins. At one point in the first Friday set, a stick flew in the air, and without missing a beat, another mysteriously appeared to continue the patter. Ari pulls sounds from every inch of the trapset, and beyond, taking his sticks to every rim and in one instance reaching out to tap on Adam’s bass. He even used his hi-hat stand like a rainstick. He has a wide repertoire of scrapes, skitters and squeals akin to a trumpeter’s artillery. And to as great an extent as any drummer I have heard, he executes within a wide range of volume and pace, often shifting gears with sudden grace and precision. His range of gleeful, maniacal expressions suggests a small child in the freeing moments of joyful discovery, an unbridled passion for his work. The drum kit is itself the playground and there are no rules, just unlimited opportunities. The strings, too, had plenty to say (and when Adam is into the zone, he has plenty to sing while his fingers fly and slide). But the drums said everything and more. Once local drum master Phil Hey noted that a careful listener could pick out the melody implied by a drummer’s patterns. I thought he was referring to rhythm and also that one might need to be at least an accomplished musician to actually identify tunes based on the drummer’s part alone. But maybe Phil was describing Ari Hoenig. Twice over the weekend I heard Ari present a long introduction to Bobby Timmons’ “Moanin.’” And we knew it was Moanin’ because every note was sounded by the mallets striking the drums. Not just the rhythm. Every tone. And I swear, he threw in little riffs of Grieg’s “Peter Gynt.” When guitar and bass joined in, it was to engage in a call and response among three melodic voices. With eyes closed, it surely sounded magnificent. But with eyes open, I could confirm that this magic came from one drumset, one man, one brain. And I could see the joy it brought to him... as well as to us. I’ve been looking forward to this weekend at the Artists Quarter since the gig was first announced. 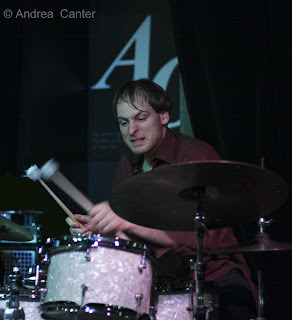 Ari Hoenig is one of my favorite drummers—visually as well as musically. I first saw him at the AQ a few years ago with long-time collaborator, pianist Jean-Michel Pilc. Hoenig is a percussive acrobat whose facial expressions mirror the music that tumbles from his flailing arms and hands. He’s been described in the press as maniacal and indeed, that seems apt. He and Pilc returned about a year ago with bassist Johannes Weidenmueller. Another outstanding show. But this time, Hoenig has another trio, without piano. He’s been playing with Israeli native, guitarist Gilad Hekselman, a wunderkind who blazed his way through Berklee (or maybe he is still blazing!) and has been getting raves on the New York scene for the past four years. And they will be joined by one of our hometown stars, bassist Adam Linz. Sounds like a recipe for a magnificent jazz feast, Friday and Saturday at the AQ (5/29-30). Brazilian music takes the Dakota stage tonight (5/29) with guitarist/vocalist Robert Everest’s ensemble, featuring Mary Louise Knutson on piano. I’m hoping to catch the first set enroute to the AQ! Stick around late at the Dakota, or come on over from the AQ for the Late Night All-Stars at 11:30 pm, a collection of some of the Late Night series’ favorites sharing the stage. Before the AQ on Saturday night, I’ll be at the Sage Wine Bar in Mendota Heights for another installment of the Jazz Vocalists of Minnesota Singers’ Jam. Featuring some of the brightest newcomers on the vocal jazz scene, the jam is always fun, and the food and service at Sage make for a full evening of fun. And it’s early, 6-9 pm, leaving plenty of time to drive across 35E to St Paul and the AQ. Two fun vocal events on Sunday night (5/31): Paula Lammers and her Cloud Nine band perform at 7 pm at the Como Park Pavillion in St. Paul; Connie Evingson and the Dakota Trio (Tanner Taylor, Gordy Johnson and Phil Hey) are on stage at the Dakota. Start here, finish there. 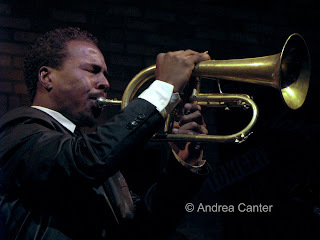 The big event of early June is the return of the Roy Hargrove Quintet, at the Dakota June 1-2. Last September, I enjoyed two gigs with this monster group, at the Detroit Jazz Festival and then a few days later at the Dakota. Aside from the fact that Roy is one of the finest trumpeters of the day (and perhaps of any day), the quintet stands out as an ensemble that gives 110% to every tune at every performance. They play each note as if recording live. Young pianist Gerald Clayton is worth the admission himself, but you surely want to be close by when Roy picks up the trumpet or flugelhorn. Roy loves the Dakota, lucky for us. If you haven’t tried the new digs of Hell’s Kitchen (in the old Rossi’s space on 9th Street, downtown Minneapolis), Tuesday (6/2) is a good opportunity when guitar wizard Zacc Harris brings in his trio with young and very talented vocalist Rachel Holder. I’ll be out of town but I would be torn between Mpls and St Paul on Thursday (6/4). 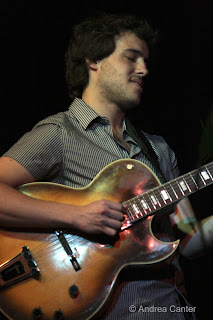 Paul Renz and his quintet are at the Dakota—great guitar, great compositions, great energy. Across the river, much the same can be said to describe Pooch’s Playhouse in their AQ debut, with more of an intergalactic vibe in another guitar-led ensemble (Joel Shapira at the helm). With Gilad Hekselman in town over the weekend, this week is definitely guitar-friendly! Looking ahead – full schedule for the Twin Cities Jazz Festival has been announced and it will be a highly concentrated three days of great music (June 18-20) within a few block radius of Mears Park in downtown St. Paul. Check the website at http://www.hotsummerjazz.com/ for details. (Hint—Jon Weber, Alex Han, Esperanza Spalding, Allan Touissaint, New Standards, Dakota Combo and more.) Bettye Lavette returns to the Dakota (June 11), Jay Epstein with Bill Carrothers and Anthony Cox celebrate a new CD release at the AQ (June 12-13), Monty Alexander performs at the Orpheum (June 12), Hiromi (June 21-22) and Karrin Allyson (June 23-24) return to the Dakota. Outdoor music gets underway throughout the city parks and more. Summer, jazz in the city! “This is my first composition,” admitted Carson King-Fournier in introducing his “Winnipeg Mambo” to a nearly full house at Antonello Hall, The MacPhail Center for Music. If this is his first effort, I surely want to hear his second! The young trombonist, headed to Juilliard in the fall, was on stage last week with the Dakota Combo, a septet of like-minded, prodigiously talented teen jazz artists directed by local trumpeter/educator Kelly Rossum. This concert closed the annual Jazz Thursdays series at MacPhail, and they ended the season with as much style as and arguably more enthusiasm than any of the other, far more experienced ensembles heard this season. 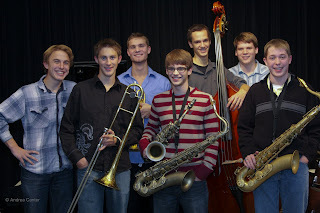 The Dakota Combo is a joint project of MacPhail and the Dakota Foundation for Jazz Education. Conceived and initiated three years ago by Rossum—himself one of the most talented and creative jazz musicians in the region, the goal of the Combo is to bring together the best young jazz artists in the area to develop skills as small ensemble performers, composers and arrangers. Each September, area high schoolers audition for one of up to seven slots in the Combo. The chosen few spend the school year rehearsing with Rossum every other week. In December, a national guest artist joins them for rehearsal and a performance on the stage of the Dakota Jazz Club in downtown Minneapolis, and for an open clinic for area students. Later in the winter, the Combo spends a day “on the road,” visiting three Twin Cities schools to share their music and interact with students as young as fourth grade. Other performance opportunities are scheduled, including the concert at MacPhail and an appearance at the Twin Cities Jazz Festival. Each year the competition, and consequently the level of performance, seems to rise a notch. And this year, the Combo also reflects a broader swath of young Minnesota musicians. Joe Strachan, pianist, comes in from Northfield. And saxophonist Ryan Freitas makes the 2-hour drive (each way) from Willmar. Determination (and supportive parents!) overcomes snowy highways. I’ve been honored to follow the Combo program since the first ensemble in fall 2006. As a member of the DFJE Board, I have observed auditions, rehearsals, and school visits; attended gigs at the Dakota, Minnesota Music Educators’ convention, Nomad World Pub, summer jazz festival and MacPhail; interviewed Rossum and the young musicians; informally chatted with parents; and just last week, observed much of a recording session at Wild Sound Studios. This was a new component of the program and hopefully will become an annual activity—taking the students into a professional studio and recording their own music. It’s not likely to raise funds as much as disseminate interest in supporting jazz education, and it provides one more learning experience on the road to a jazz career. Consistently across each edition of the Combo, and perhaps most clear among the current (third) ensemble, I am impressed with the depth of commitment expressed by these 17 and 18-year olds as well as their level of artistic vision. Each has an intensity of purpose and hunger to learn that goes well beyond desire to the level of necessity—they must play, they must learn to play better, they must jump on every opportunity. That horn, drum set, bass, piano is an extension of arms and legs and brain, and making music is as essential as breathing. Such observations have been made over the years about the geniuses of the art—Louis Armstrong, Duke Ellington, Charlie Parker, John Coltrane, Bill Evans, Charles Mingus. As for “Winnipeg Mambo,” it was a filled with more tropical heat than winter gusts, sharp ensemble writing that energized the crowd at MacPhail as well as the band at Wild Sound. But to me the real tour de force for trombone came from bassist Cory Grindberg, whose “Faded” allows King-Fournier unlimited opportunities to pull a brass zoo of sounds from his instrument, suggestive of an Addams Family jam session. 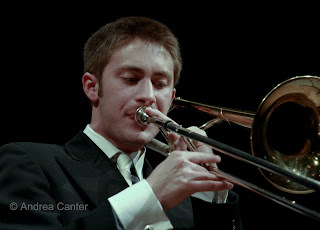 And a few months ago at the MME convention, when the trombonist was not available, “Faded” proved equally well suited to the antics of trumpeter (and soon-to-be New England Conservatory of Music student) Jake Baldwin. Each Combo musician will end his tenure with at least one memorable composition on record. Personally, another favorite comes from tenor saxophonist Tony Pistilli (headed to the fine jazz program at UW-Eau Claire). His “Aakar” swirls elegantly, conjuring ancient rites of the Holy Land. Kelly Rossum is tenacious in his efforts to pull the most from his students, yet also holds high expectations for their independent musical decisions and is quick to downplay his role in their success. During the first big performance at the Dakota, he’s nearly invisible at a table in the mezzanine. At MacPhail, he makes a short introduction and vanishes into the middle of the audience. He gives them the tools, but not a script. He won’t lead the band—they learn to lead themselves, make their own mistakes, and write their own music. “It’s not about scales,” Kelly said. “It’s about life.” And for these young artists, life and music are pretty much the same thing. The current edition of the Dakota Combo has two more public performances – on June 19th at 4 pm at Mears Park in St. Paul’s Lowertown, opening the 2009 Twin Cities Jazz Festival; on July 18th at 11:30 am on Peavey Plaza in downtown Minneapolis, opening the Student Stage segment of the Sommerfest music day. Watch for their CD! Check the Combo website for audition information for 2009-2010 at www.dakotacombo.com. Also check the Three Minute Egg for a video clip of the MacPhail performance and comments from students and Kelly Rossum at http://www.minnpost.com/braublog/2009/06/04/9292/arts_coverage_done_right_3_minute_egg_comes_to_tpt. 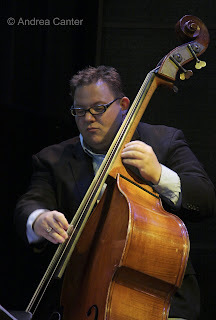 MacPhail recently named bassist/educator Adam Linz to replace Rossum who will be moving to New York in September. The Artists Quarter features a rare pair of weekends with national artists to close out the month, while the Dakota features a pair of sterling vocalists for the holiday. Meanwhile, Orchestra Hall reprises a popular Latin Jazz show highlighting the talents of one of its premiere trumpeters. If you stay in town for Memorial Day weekend, your jazz ears will be amply rewarded! It’s a songful weekend at the Dakota. 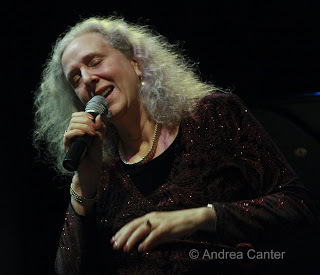 Local favorite Patty Peterson—always entertaining and always on key—joins forces with Fred Steele for two nights of gospel-tinged jazz and blues (5/22-23). Rounding out the long weekend, award-winning journalist turned jazz singer Rondi Charleston returns Sunday night (5/24) with most of the band that recorded In My Life, her new CD/DVD release. The DVD was recorded live at Dizzy’s Club Coca-Cola, while the CD is a pristine studio effort. Her repertoire includes a few favorite standards, less familiar covers and some of her own compositions. While Rondi may be relatively new to the jazz circuit, she has a long history of vocal and drama studies as well as a former career as an investigative reporter. Uncovering stories as a journalist is apparently good experience for uncovering the story in a lyric. Saxophonist Joel Frahm has an uncanny rapport with Rondi; drummer Alvester Garnett and guitarist Dave Stryker also return from her 2007 tour, but I will miss pianist Bruce Barth and flautist Hadar Noiberg (both appear on the recordings). Another great night of song is set for Crave at the Galleria on Friday (5/22) when Debbie Duncan and frequently cohort Mary Louise Knutson cram into the teeny “stage” space across from the usually noisy bar. The food is good and reasonable, and if you watch carefully around 10 or so you can grab a table much closer to the music and enjoy a rare intimacy with the musicians—who will appreciate your attention! Looking for something cool after hours on Friday to kick off the weekend? 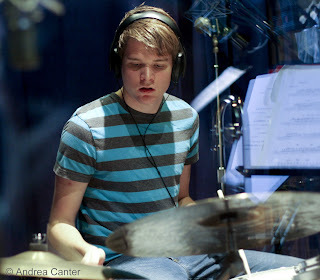 It’s “Not Fat Kid Wednesdays” at Café Maude (5/22) when Michael Lewis and Adam Linz join drummer Jay Epstein. Make it Skinny Kid Fridays? Whether it’s JT Bates or Jay Epstein on drums, it’s a win-win situation. It’s jammed at Maud on weekends but show up after 10 and you can probably sit down, eventually. It's a busy weekend for Lewis who appears with the ultimate "youth oriented" Happy Apple at the Cedar on Saturday (5/23). 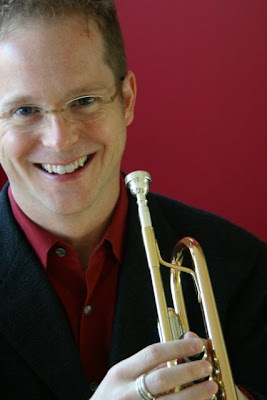 In 2007, trumpeter Charles Lazarus presented “A Night in the Tropics” at Orchestra Hall, with jazz quintet and his cohorts from the Minnesota Orchestra. Revived for the holiday weekend, Lazarus again shows off his extensive jazz chops with tunes associated with tropical climes, from Jobim to Gershwin. I missed the premiere but intend to make up for it Saturday night (5/23). Lazarus is one of those rare musicians who has attained credibility across genres. His jazz release Zabava (from late 2008) is an outstanding integration of sounds of East European traditions and jazz fusion, in the best sense of the term. I plan to cheat and put it on my “best of the year” list for 2009. 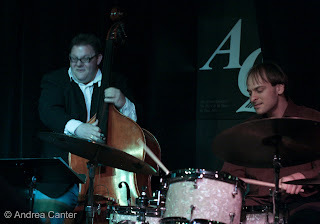 Good sounds continue the rest of the week, with the Dean Granros Trio (5/27) and Pete Whitman’s X-Tet (5/28) at the AQ; the edgy Atlantis Quartet (5/28) at the Dakota; another Wednesday night with Maud Hixson and the Wolverines at Hell’s Kitchen (5/27). Coming soon: The AQ brings another national show to the stage (5/29-30), this time it’s quirky and insatiably creative drummer Ari Hoenig, along with Israeli guitarist Gilad Hekselman and local bassman Adam Linz. That’s a can’t –miss combination. Another can’t-miss is the return of the Roy Hargrove Quintet to the Dakota on June 1-2. Photos: Dave Hazeltine; Charles Lazarus; Rondi Charleston. (Hazeltine and Charleston photos by Andrea Canter. Lazarus photo from his press kit. Earlier in the day, he had served as a special guest judge of the annual “Jazz Piano Scholarship Competition” for high school students. Three very talented 18-year-olds performed on the stage of the Dakota Jazz Club, their efforts critiqued by two of the finest pianists in the area—Mary Louise Knutson and Tanner Taylor. 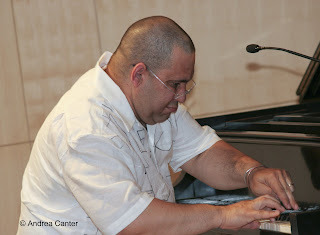 And one of the finest pianists anywhere, Marcus Roberts. Roberts was constructive but firm in his comments, encouraging the young artists—each already well advanced beyond his years-- to add more rhythmic and dynamic diversity, to consider more space “like Ahmad Jamal,” to “listen to drummers” and expand their “knowledge of the language.” “Remember you can play bebop melodically like Charlie Parker or Bud Powell.” Most of all, Roberts encouraged the pianists to learn the history of the music and integrate that history into their own work. A few hours later, Marcus Roberts himself was on the Dakota stage, giving life to his teachings. As he has throughout his career, he unearthed the history of jazz as a foundation for improvisations and original compositions, and in solidifying the genius of the past, created a new meaning of genius in the present. Scott Joplin, Jelly Roll Morton, Fats Waller, Pete Johnson, George Gershwin, Duke Ellington, Thelonious Monk, traditional gospel—much of the music of the 20th century informs every note, every chord. Not just the set list, but within each tune within each set, Roberts echoes the giants of rag, stride, swing and bop, while at the same time serving up improvisations as much in sync with 21st century masters like Mehldau and Moran. “Vary the dynamics!” “Make more use of the left hand!” “Learn the language!” Roberts started his first set fully charged with Jelly Roll Morton’s “New Orleans Blues,” left and right hands in full collaboration as he journeyed back and forth from pianissimo to forte and all points in-between. Fats Waller’s “Jitterbug Waltz” was a model of gymnastic precision yet also a launching pad for a Monk-inspired riff suggesting “Misterioso;” Monk himself inspired Roberts to stride-infused variations (“In Walked Bud”) and speed-demon demonstrations of crystal clear articulation (“Ba-Lue Bolivar Ba-Lues-Are”). His “Cherokee” coaxed a symphony orchestra from the Yamaha grand—a full verse of solo left hand that continued its patterns as the right hand took charge of the melody, then double-timing the third verse, then moving ahead an octave as if each hand led its own section of strings and horns. Gershwin’s “Our Love Is Here to Stay” perhaps best reflected a tradition transformed, with the swing feel of the 20s and 30s evident in Roberts’ 21st century voicings and conceptualizations. Marcus Roberts has established himself as an original interpreter of the most original composers, which perhaps has obscured his own talents as composer. Particularly his first set at the Dakota provided ample opportunity to remind us that his reverence for jazz tradition informs—but does not constrict-- his own writing. “After the Party Is Over” conjured Bach as much as Monk; “Hidden Hues” suggested the delicacy of Bill Evans with ragtime syncopation, while “Finding Common Ground” seemed to bring forth the entire history of jazz piano. All apt descriptions of Marcus Roberts, solo pianist and composer. And eloquent critic of young jazz musicians. The future of jazz is on full display in the Twin Cities this week, starting with the 5th annual Jazz Piano Scholarship competition finals on Sunday and ending with the annual “Jazz Thursdays” concert hall performance by the Dakota Combo. And for these young upstarts there are plenty of admirable role models on the bandstands as well. Tonight (5/15), one of the area’s pre-eminent jazz educators and multi-reed virtuosos, Dave Milne, performs with the ANCIA Quartet, an ensemble of area musicians who have been together for nearly 20 years. 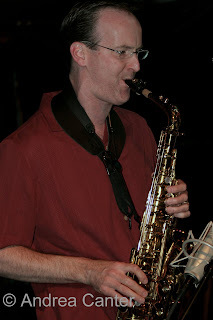 The four saxophonists (Milne on tenor, Angela Wyatt on bari, Matthew Sintchak on soprano, and Joan Hutton on alto) are “dedicated to the creation and performance of new works for saxophone quartet as well as the performance of traditional saxophone quartet repertoire.” That repertoire has included the works of classical composers from Bach to Debussy, of jazz composers from Gershwin to Ellington, and original compositions from ANCIA members. Tonight’s program features new works based on South Phillippine gong music, Sufi Whirling Dervishes, and Dave Milne’s arrangements of Chick Corea’s “Children’s Songs.” And what better setting for such artful music than the U of M’s Weisman Art Museum, Riverview Gallery? And it’s free. Lucia Newell is always a treat to hear, and one of the most innovative vocalists in the Midwest. This weekend at the Artists Quarter (5/15-16) she celebrates one of the most innovative voices in modern jazz, the late Betty Carter. Carter was one of the pioneers among vocalists, using her voice as an improvising instrument. Lucia is no stranger to improvisation, and with Chris Lomheim, Terry Burns and Phil Hey, will give the audience not only a good dose of Betty Carter, but a showcase of Lucia Newell. Sunday night (5/17) finds another virtuoso pioneer, pianist Marcus Roberts, in a rare solo performance at the Dakota Jazz Club. One of the true scholars of jazz history who has both revived the classical repertoire and demonstrated how tradition can inform modern music, Roberts will be wearing his jazz educator hat earlier in the day when he serves as guest judge for the 5th annual Jazz Piano Scholarship Competition finals at the Dakota. He’ll join Tanner Taylor and Mary Louise Knutson in evaluating the performances of three outstanding high school jazz artists—Chris Misa (Perpich Center for Arts Education), Cody Peterson (Stillwater H.S.) and Joe Strachan (Northfield H.S.). These finalists (already winners of $500 scholarships) will perform solo and in trio backed by local stalwarts Adam Linz and Phil Hey. It’s always an inspiring event that rekindles your faith in the future of jazz! And it’s free and open to the public. You can pick up quite a lot from the comments of the judges! The competition is sponsored by the Schubert Club and the Dakota Foundation for Jazz Education. 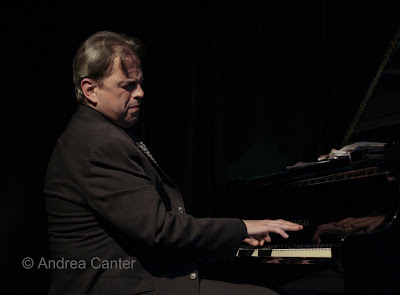 More inspiration will be on the stage of Antonello Hall at the MacPhail Center for Music when the third edition of the Dakota Combo performs in the last of the season’s Jazz Thursdays concerts on May 21st. This septet, directed by Kelly Rossum, has chops to burn – you aren’t likely to hear a high school band of this caliber anywhere else. These young musicians will be warmed up from a recording session earlier in the week at Wild Sound Studios, and will perform from a largely original repertoire. And it’s free. Most of the band are graduating seniors, soon to head to such schools as Juilliard, the New England Conservatory, Lawrence Conservatory, Northwestern and Michigan State. As always, there’s a lot more going on throughout the jazz circuit—a CD release from the tuba-lead Ingo Bethke (Dakota Late Night, 5/16); some red hot Cuban jazz at Café Maude on Saturday (5/16) with Viviana Pintado, Matt Darling and Frank Rivera; an evening with the cast of the Guthrie Theater’s “Caroline” at the Dakota (5/18); the always implosive Jazz Implosion at the Clown Lounge in St. Paul (5/18); a night with the Atlantis Quartet at the AQ (5/20); the always fabulous Debbie Duncan at the Dakota (5/20) and Phil Hey Quartet at the AQ (5/21); Wednesdays in May with Maud Hixson and the Wolverines at Hell’s Kitchen (5/20); Charmin Michelle and Denny Malmberg at Fireside Pizza (every Monday and Wednesday). And coming up: New York piano master David Hazeltine at the Artists Quarter, May 22-24; award-winning reporter turned vocalist, Rondi Charleston and an all-star band led by Bruce Barth at the Dakota on May 24th. Photos: (Top) Dave Milne; Lucia Newell; the Dakota Combo (L-R Joe Strachan, Carson King-Fournier, Jake Baldwin, Ryan Freitas, Cory Grindberg, Cameron LeCrone, Tony Pistilli). 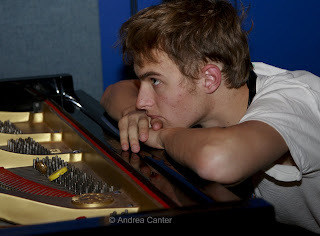 All photos by Andrea Canter. Nachito Herrera is back for a Cuban Fiesta weekend at the Dakota (May 8-9) featuring long-time collaborators Raul Pineda and Jesus Diaz. No cigars allowed but the night will be smoking nevertheless. Some of the most exciting modern jazz in the area comes way after dark. Tonight (5/8), “Late Night at the Dakota” presents three of the most creative purveyors of the art, with Scott Fultz, Adam Linz and Alden Ikeda on the bandstand from 11:30 pm – 2 am. Then Saturday night, wander over to Café Maude (no reservation needed after 10 pm) for another hot trio, Matt Peterson, Dan Musselman and Jay Epstein. Another popular performer here in recent years, trombonist/producer Delfeayo Marsalis returns with his quintet for two nights at the Dakota. Most recently Marsalis led a band at Orchestra Hall and was the guest artist/clinician for the student band, The Dakota Combo, in December 2007. Obscured for years by his star siblings while production took precedence over performance, Delfeayo apprenticed with the late Elvin Hays before climbing into the spotlight with his own band, recording and tours. Now a mentor to young rising stars, he brings a new band into the Dakota May 12-13. Another chance to see stars in the making, the Artists Quarter hosts a night of music from the St. Thomas University Jazz Ensemble, directed by Joan Griffith (5/14). If you are looking for some local vocals, it’s a great week with ultimate torch singer Carole Martin at the AQ on Saturday night (5/9); Lee Engele and Joel Shapira earlier in the evening at the Sage Wine Bar in Mendota Heights (5/9); Charmin Michelle and Denny Malmberg at Fireside Pizza (5/11 and 5/13); Maud Hixson with the Wolverines Trio at Hell’s Kitchen every Wednesday in May(5/12); Rhonda Laurie and Reynold Philipsek at the Sage on 5/13. Plan ahead? Lucia Newell and the Laura Caviani Trio salute the great Betty Carter next weekend at the AQ (5/15-16); Marcus Roberts gives a rare solo performance at the Dakota (5/17); and David Hazeltine flies in from New York for Memorial Day weekend at the AQ. Youth jazz also is in the spotlight—the annual Jazz Piano Scholarship Competition finals take place at the Dakota at 2 pm on May 17th, with Marcus Roberts serving as guest judge; the Dakota Combo gives their annual spring concert at the MacPhail Center for Music on 5/21, just two days after completing a studio recording session. 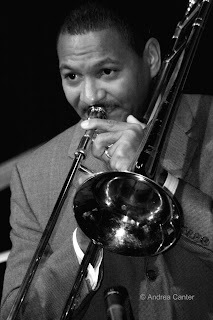 Photos: (Top) Nachito Herrera; Delfeayo Marsalis. Photos by Andrea Canter.